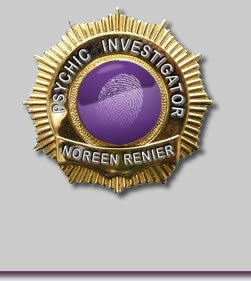 POLICE are singing the praises of psychic investigator Noreen Renier after she used her amazing powers to solve a missing persons case that had baffled authorities for months. Remarkably, the lost man's body was found EXACTLY where Renier said it would be! 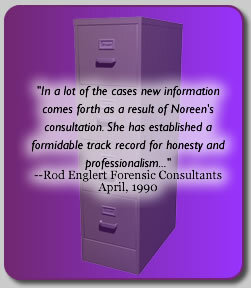 "People scoffed at us for seeking out a psychic's help, but Noreen's input was quite incredible...even a bit spooky," Detective Sgt. John Buchholz of the Oxford, Ohio, police department told The ENQUIRER. "In this case, the person had been missing for six months. But the body was recovered where Ms. Renier told us we would find him." Cops consulted renier of Charlottesville, Va.-the only psychic ever hired by the FBI-after 81 years-old Alzheimer's patient Charles Capel disappeared and several searches near the home of the former professor failed to turn up anything. Police believe he wandered off and got lost in the woods. "Professor Capel's disappearance was causing his family a great deal of distress," Sgt. John Squance told The ENQUIRER. "Everyone wanted him found, but we kept drawing blanks." 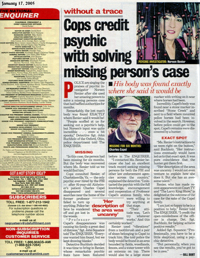 Detective Buchholz decided it was time to bring in Renier, whose remarkable psychic feats have been featured before in The ENQUIRER. "I contacted Ms. Renier because she had and excellent track record seeking missing persons for both the FBI and other law enforcement agencies across the country," explained the detective. "I contacted the psychic with the full knowledge, encouragement and cooperation of Professor Capel's anxious family, who were willing to try anything at that stage. "Their attitude was, 'Let's try whatever works.' And this certainly worked." Renier used "vibrations" from a toothbrush and a pair of shoes belonging to Capel to track him. She told police the body would be found in an area bounded by fields, woodlands, fences, and a water tower with an antenna on top. There would also be a large stone marker with writing on it near where horses had been. Incredibly, Capel's body was found near a stone marker inscribed "Stone Creek" and next to a field where mounted police horses had been involved in the search. However, before police could get to the spot, Capel's remains were discovered by a hunter. "Ms. Renier's instructions to us were right on the button," said Buchholz. "Her instructions eventually would have led us to that exact spot. It was pure coincidence that the hunter got there first. "Her description of the area was uncanny. I would not even venture to explain how she does it. But she has an awesome talent." Renier, who has made recent appearance on Court TV and "The Larry King Show," is delighted at the outcome of the case for the sake of the Capel family. "I am just so happy to be in a position to help," Renier told The ENQUIRER. "I credit the open-mindedness of the officer in charge, Det. Sgt. Buchholz, for helping achieve positive results." Added Sgt. Squance: "Professionally, you have to be a little skeptical, using a psychic detective. "But personally, when you see the results, you've got to be in awe."